By the time Thomas de Keyser painted this small likeness in 1631, however, the laws of portraiture had been modified to fit the demands of the class of prosperous Dutch burghers. 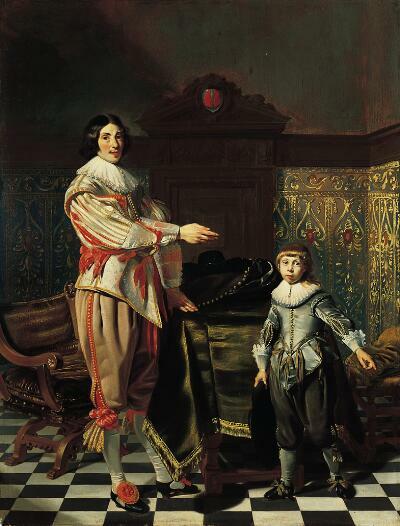 It is unclear exactly who these sitters are, but the coat of arms above the door suggests that they may be the Amsterdam merchant Dirk van der Wissel and his 7-year-old son, Jacob. Dressed in elaborate silk and satin clothing, they are standing before a large table, draped in sumptuous green velvet. Plush pillows and gilded leather wall coverings imply great status and wealth. Both subjects direct our attention to the right, outside of the picture frame, where a companion portrait of the female family members may once have hung. In spite of his attention to dress and setting, de Keyser gave little sense of his subjects’ personality. With his refined sensibility for vivid colors and sharply delineated form, he applied the standards of court portraiture to small, intimate likenesses appropriate for the home. In the following years, many Dutch painters would emulate his clear, airless interiors and attention to minute detail.